A wedding is more than two people getting married. A wedding is the celebration of the life long commitment two people make when they are madly in love. It is a day that most brides have been fantasising about since they were five years old and watched the movie Cinderella for the first time. When this fantasy becomes reality—one thing is for certain— the day must be everything the couple wants and more. Your wedding day is a day you will remember for the rest of your life, so every detail and vision must be carried out with great success. While our sister company at WeddingLight Events can make sure your Paris based fairy tale is planned to perfection, the bride still has to make sure she has a wedding dress that will make her look and feel like a princess. We propose a selection of couture wedding gown that can be rented for a day to make your dream come true! Lanvin dress in pleated ivory silk with pretty V neckline front and back decorated with a jewel belt. We think every bride to be would agree,when eloping in Paris, wedding photographs are everything. Photographs serve as one of the best memories. They are what you get to show off to all of your friends and family when you return back home, and most likely what you will enlarge, frame, and hang all over your house. So when you and your other half visit Paris—one of the most romantic cities in the world—photographs are a must. Lets face it, every woman dreamed about getting kissed under the eiffel tower, so why not capture the moment. Honeymoon photography is also so popular right now, since it is a time where the newly weds can get both fun and beautiful photos taken privately together. Most couples would even agree that the memory itself of just taking the photos really adds to the adventure of their honeymoon. Plus, with a background like Paris, it would almost be wrong not to take advantage. John Galliano dress in ecru tulle embroidered fluid very small gold sequins, with a sail effect on the arms and skirt of lightness and transparency. When “Happily Ever After” begins in Paris, the bride will look best spent in a couture gown as beautiful as she is. If you think a couture wedding dress is an untouchable option for you because of price and distance, think again. 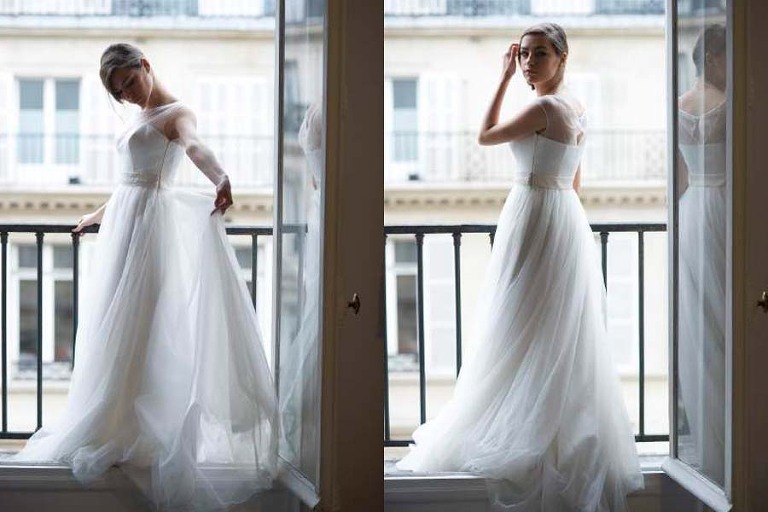 The showroom is located in the center of town, steps away from the Louvre and specialises in renting couture and wedding gowns with fun and creative photography. The collection includes designers such as YSL, Dior, Chanel, and even wedding gowns from Carolina Herrera and Vera Wang. The company was established in 2009 specifically for special event gowns, and within the past two years expanded further to wedding dresses after many requests. The idea was started after realising how many women buy beautiful dresses for events that they will only wear one time. We have been recognised for such a brilliant idea by numerous different well known magazines such as Elle Magazine, and Marie Claire. Most brides only wear their wedding dress for one day, and then it is put into a closet to never be touched again. Ugo Zaldi white dress with wide tulle skirt, top with short sleeves and round neck white tulle on a pretty strapless white satin. We have recently done a photo session with some of our wedding gown, including some of the ravishing dresses we have on offer. Be sure to check out the photos for a better idea of what we have in our Paris showroom! But we will warn you in advance that you may find it difficult to choose just one! So if you are looking for the dream wedding dress for your forthcoming wedding, a Paris photo session, engagement photo shoot or some honeymoon portraits with your love one in Paris & the eiffel tower in the background, I would suggest you simply contact us directly for further information over the phone. Trudel and Hamid are Norwegian designers. The purity of their lines perfectly reflected in this lovely white empire waist chiffon dress which the lace detail on the strap brings a romantic softness. Sonia Rykiel medium long ecru colored dress with a beautiful flowers organza, tulle, chiffon and grosgrain. John Galliano dress in ecru embroidered bustier pearls and rhinestones with a skirt adorned with long vertical stripes alternating precious lace and chiffon. Lanvin strapless short dress all tulle, strapless with a long belt and wide grain. Nicole Miller is a New York designer. Modernity and simplicity is what characterize he collections as seen in this that forms a train. Sheath creation by Johanne Riss in white jersey neoprene, with a laced back and a mermaid skirt. Carolina Herrera has been the head of a large New York based brand since 1980. This strapless gown silhouette inspired by the 50s with an overlay of organza, worked eyelet embroidery and tulle, giving it an extraordinary volume effect. Vera Wang is a famous New Yorker designer. The Dinah dress is a classic model of its collection, with tulle, lace and lightness, and a belt in a wide grosgrain counterpoint. Carolina Herrera has been the head of a great New Yorker based brand since 1980. This strapless silver sequined cream sheath purified form gives birth to a veil of muslin lagging effect in the back of the dress. Matthew Williamson is a London designer. This fluid model ruffled chiffon empire shape is enhanced by the beautiful bead work on asymmetrical straps. David Fielden is a British designer who studied choreography. Very inspired ballet that white dress has a square neckline with thin straps fully embroidered lace and a wide skirt of tulle tutu way. White satin sheath by John Galliano covered by a veil of organza, embroidered with small white flowers on the bustier and opening in the back. The dresses range from size 34 to size 44. We have other models in the showroom. Rental rates depend on the model you choose. You must make an appointment with us a couple of days prior to your big day so that the dress can be altered if needed. Sending us an email with your measurement might come handy as well. We are looking forward to welcoming you in Paris. © 2019 Destination wedding photographer videographer Paris Normandy France|ProPhoto Photographer Template|Design by Northfolk & Co.